Although they appear to be one color, solid black German Shepherds typically have a few tan hairs between their toes or under their tail. 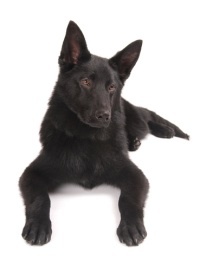 Healthy and well groomed black German Shepherd dogs have a shiny coat earning them the nickname, "Lacquer Blacks." Not as common as the black and tan or sable colored shepherds, a black german shepherd dog is a striking sight. While white German Shepherds are considered a faulty color by the AKC, both black and white shepherds are produced by a recessive gene. This can lie dormant for generations. 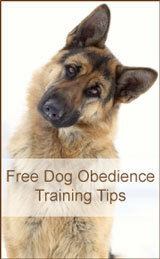 Both the sire and dam must be carriers of the gene in order to produce black german shepherd puppies. Do not use coat color as the primary reason in choosing your dog. Health and temperament are much more important.